How beautiful, hopefully people will only admire them from a safe distance, and leave them alone instead of trying to capture them. Dear Whales: R U N !!!! S W I M !!! GET OUT OF THERE! SWIM FOR YOUR VERY LIVES! Scotland! Nice to hear of some more good widlife on the shores of my home land and so close to my Island, the Isle of Skye. Cool! Dont worry whaling is well and truly illegal in Scottish waters. I hope they are left alone aswell. I mean honestly if they didnt want to be there, they wouldnt be. They are very inteligent mamals. As long as they dont get beached and people need to help em, i think we should leave em be! 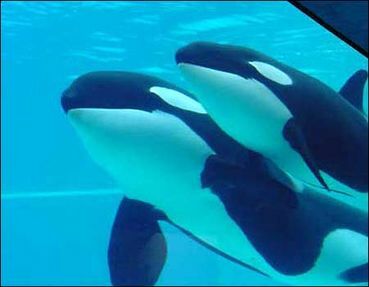 Let these beautiful, intelligent mammals be--just be, swimming about their business and enjoying the sights and food... never kil or harm them in any way. As much as a joy as it is to see rare wildlife, it strikes me as further evidence of global warming when you find animals outside of where they "normally" roam. I agree with Jenn in hoping that people admire them without frightening them or hurting (especially trying to capture) them. I hope that their food is moving along with them as the sea temperatures fluctuate! The whales are aware of the climate change. They are intelligent mammals. I read where so me scientist is saying that whales and dolphins have such large brains , not because they are intelligent, but because they need the larger brain to keep them warm as they are cold blooded. I personnally have never heard of a cold blooded mammal. the cold blooded species are the reptiles. Hope these beauties will make it to old age.